Built-shelf ledge, approximately 1" (25mm) high, provides security, preventing contents from falling off shelf. Each shelf holds up to 250 pounds (113kg). Also available in qwikSLOT style. Metro Drop Mat Shelving can increase storage capacity by as much as 20% by positioning the ledge above the shelf surface as opposed to below, as found on conventional shelving. Organize your shelves with these 8" (203mm) high, easy to snap-in-place dividers! 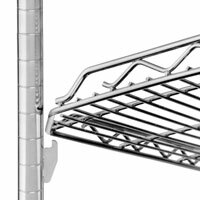 Metro qwilSLOT shelves offer the quality of Super Erecta with the convenience of easily adjustable and removable shelves. Four shelf clips are provided with each shelf. 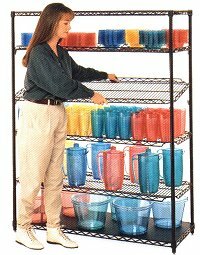 Each unit requires a standard Super Erecta shelf at the top and bottom. Metro qwilSLOT shelves offer the quality of Super Erecta with the convenience of easily adjustable and removable shelves. Four shelf clips are provided with each shelf. Each unit requires a standard Super Erecta shelf at the top and bottom.